"I'll take the ceramic dalmatian for 600, give me the one free week of maid service, and, uh, I'll take the hat rack." And then Alex Smith broke his leg in 16 pieces, the offensive line fell apart, and by the time the season was mercifully over, the Landover team finished 1-6 in its final seven games with a point differential of -79. 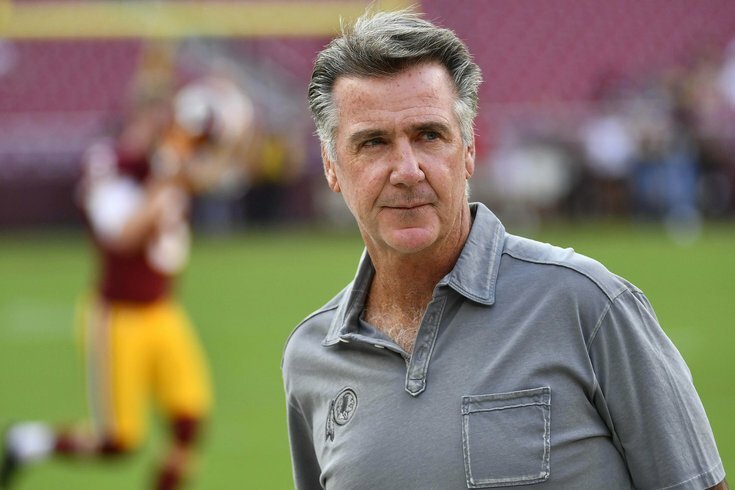 In GM Bruce Allen's nine full seasons there, the Landover team's record is now 59-84-1. That would be a winning percentage of 0.413. Somehow, he is allowed to continue to call the shots for this team, and he reportedly isn't even bothering to get input from the head coach about any of the moves he's making. The #Redskins have not consulted head coach Jay Gruden on any of their offseason moves says @EBJunkies, citing a source: "I'm told he heard about the Landon Collins signing through the media." Anyway, with Smith unlikely to recover from his gruesome injury anytime before the 2020 season, the Landover team is riding with a gaggle of backup quarterbacks (for now), and looks nowhere remotely close to playoff contention. Let's take a look at what they have done in free agency. • QB Case Keenum: The Landover team gave up a sixth-round pick for Keenum and a seventh-round pick, so they got him for basically nothing. He's also not going to cost a lot, money-wise, so this really isn't an awful acquisition. Except that, you know, there's a decent chance that they're going to go into the season with a Colt McCoy - Case Keenum starting quarterback competition. I feel your pain, Jay. I mean, if the nicest thing you can say about your newly acquired quarterback is that his skill set mirrors that of your other crappy quarterback, that's obviously not ideal. • S Landon Collins: Six years, $84 million. For a box safety. Lol. Bruce Allen has no idea what he's doing. • CB Dominique Rodgers-Cromartie: DRC, who will be 33 in a couple weeks, came out of retirement to cost the Landover team a compensatory pick before he moves on to something else next year. What a stupid signing. • RB Adrian Peterson: Peterson had a surprising season in 2018, carrying 251 times for 1,042 yards (4.2 YPC) and 7 TDs. That was after he had a 3.1 yards per carry average playing for three different teams between 2016 and 2017. Peterson will turn 34 this week. While he didn't exactly get a ton of money, he's still a 34 year old running back on a team that's going nowhere in 2019. • OT Ereck Flowers: Omg. Flowers' career has been a disaster since the Giants made him the ninth overall pick in the 2015 NFL draft. Flowers is scheduled to count for $3,203,125 on the cap in 2019, and like DRC above, he'll cost the Landover team another comp pick. • OLB Preston Smith: Smith signed a big contract with the Packers that the Landover team was right not to try to match. However, they would have likely gotten a third-round pick for losing him, if, you know, they didn't overpay Collins. • LB Zach Brown: Brown was a cap casualty this offseason after leading the team with 223 tackles over the last two seasons. • WR Jamison Crowder: Crowder had a down year in 2018 due to 7 games missed, but he is a nice slot receiver who attracted a nice pay day from the Jets. • OL Ty Nsekhe: Nsekhe was a very valuable player, coming off the bench and competently playing multiple positions along the line. This was a great signing by the Bills, and a potentially big loss for the Landover team. Replacing Nsekhe will be Flowers, who, as noted above, isn't good. • S Ha Ha Clinton-Dix: Much like the Eagles' acquisition of Golden Tate at the trade deadline last season, the Landover team's trade of a fourth-round pick for Clinton-Dix was ill-advised. He walked after just eight games. • DL Stacy McGee: Like Brown, McGee was a cap casualty, though his snap numbers were low. The Landover team lost a number of decent contributors, but at least that cleared some cap space to spend on new acquisitions. Thankfully for Allen, he's somehow not even the worst GM in the division, which we'll get to tomorrow. Still, D.